You can get back to Fortnite’s spawn island. Here’s how. Fortnite’s spawn island is a place of safety, of dance-battles and target practice. It offers a place of tranquility before everyone there jumps out of a flying bus and starts to shoot anything that moves in a desperate scrabble for survival. It’s the calm before the literal storm. That is, unless you can somehow get back to it during the game itself. That’s something that players have being trying to pull off for months, but with the arrival of Fortnite’s shopping carts last month, on YouTuber seems to have found a successful way to return to the island. They might all be a little bit glitchy, but which is the best battle royale game? YouTuber OrangeGuy and two teammates discovered that they could get around – or potentially over – the invisible wall that has previously prevented players from building or flying to the island. Using an awful lot of materials, the group built a bridge from the southern tip of the island, ending at the boundary surrounding the island. By using a shopping cart, two of the players manage to get onto the island. You can watch a video of their attempt below, as captured by the replay editor. Given that no-one is really supposed to be in that spot, there’s a bit of a visual glitch as the camera tries to figure out what’s going on, but eventually the players both seem to land safely on the island. Well, I say safely, but obviously by this point the storm has well and truly rolled in, meaning it doesn’t take long before the players eventually get downed. 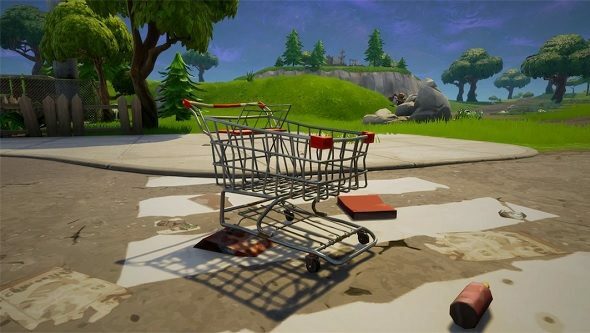 What remains to be seen is whether this exploit can be regularly replicated by the community at large – Fortnite’s shopping carts do seem to be a little buggy in certain situations, whether that be breaking into the mystery hatch or flinging players to their untimely deaths.